Britten: Peter Grimes, Op.33 / Prologue - "Peter Grimes!" Britten: Peter Grimes, Op.33 / Prologue - "You sailed your boat"
Britten: Peter Grimes, Op.33 / Prologue - "Peter Grimes, I here advise you!" Britten: Peter Grimes, Op.33 / Prologue - "The truth...the pity..."
Britten: Peter Grimes, Op.33 / Act 1 - "Oh, hang at open doors"
Britten: Peter Grimes, Op.33 / Act 1 - "Hi! give us a hand"
Britten: Peter Grimes, Op.33 / Act 1 - "I have to go from pub to pub"
Britten: Peter Grimes, Op.33 / Act 1 - "Let her among you"
Britten: Peter Grimes, Op.33 / Act 1 - "Look, the storm cone!" Britten: Peter Grimes, Op.33 / Act 1 - "And do you prefer the storm"
Britten: Peter Grimes, Op.33 / Act 1 - "What harbour shelters peace"
Britten: Peter Grimes, Op.33 / Act 1 - "Past time to close!" Britten: Peter Grimes, Op.33 / Act 1 - "We live and let live"
Britten: Peter Grimes, Op.33 / Act 1 - "Have you heard?" Britten: Peter Grimes, Op.33 / Act 1 - "Now the Great Bear and Pleiades"
Britten: Peter Grimes, Op.33 / Act 1 - "Old Joe has gone fishing"
Britten: Peter Grimes, Op.33 / Act 2 - "Glitter of waves"
Britten: Peter Grimes, Op.33 / Act 2 - "Let this be a holiday"
Britten: Peter Grimes, Op.33 / Act 2 - "This unrelenting work"
Britten: Peter Grimes, Op.33 / Act 2 - "Fool to let it come to this!" Britten: Peter Grimes, Op.33 / Act 2 - "What is it?" Britten: Peter Grimes, Op.33 / Act 2 - "People!...No! I will speak!" Britten: Peter Grimes, Op.33 / Act 2 - "We planned that their lives"
Britten: Peter Grimes, Op.33 / Act 2 - "Swallow! Shall we go"
Britten: Peter Grimes, Op.33 / Act 2 - "Now is gossip put on trial"
Britten: Peter Grimes, Op.33 / Act 2 - "From the gutter"
Britten: Peter Grimes, Op.33 / Act 2 - "Go there!" Britten: Peter Grimes, Op.33 / Act 2 - "Now!...Now!" Britten: Peter Grimes, Op.33 / Act 2 - "Peter Grimes! Nobody here?" Britten: Peter Grimes, Op.33 / Act 3 - "Assign your prettiness to me"
Britten: Peter Grimes, Op.33 / Act 3 - "Pah!" Britten: Peter Grimes, Op.33 / Act 3 - "Come along, Doctor!" Britten: Peter Grimes, Op.33 / Act 3 - "Embroidery in childhood"
Britten: Peter Grimes, Op.33 / Act 3 - "Mr.Swallow!" 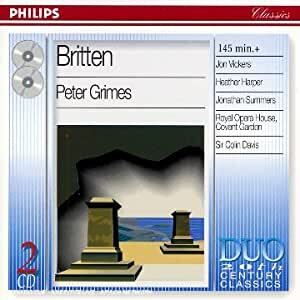 Britten: Peter Grimes, Op.33 / Act 3 - "Who holds himself apart"
Britten: Peter Grimes, Op.33 / Act 3 - "Grimes! Grimes!" Britten: Peter Grimes, Op.33 / Act 3 - "Peter, we've come to take you home"
Britten: Peter Grimes, Op.33 / Act 3 - "To those who pass the Borough"
5つ星のうち5.0Fantastic recording, fantastic opera--no libretto. This recording of Peter Grimes is the best I've heard; Vickers in the title role is magnificent, imparting a stellar musical performance and dramatic vocal one. The recording quality is excellent. My only objections is the lack of libretto and frankly mystifying cover, both of which are secondary considerations in light of this remarkable recording. The instrumental interludes have become symphonic staples. The chorus parts are unsurpassed for their dramatic impact. This was one of John Vickers' signature roles, and he was one of the greatest dramatic tenors of his time. It is not background music. It is a powerful experience. Given that this recording has attracted five star raves ever since its issue - except for the moronic ratings arising from problems downloading or flaws in the CDs themselves - posting "only" four stars is to give hostages to fortune and inevitably invite negative votes and responses. I would merely point out that the star system is devised to indicate a personal response and that, try as I might, I have endeavoured for years to "love it" (= five stars) but as much as I admire things in it I do not, nor do I think it is artistically flawless. Amid the superb performances from a tortured, very powerful, yet subtle Jon Vickers, an equally nuanced portrayal of Ellen Orford from Heather Harper, some striking individual contributions from such as Thomas Allen as Ned Keene and some really vital playing, singing and conducting from Colin Davis and the Royal Opera forces, there are some pretty geriatric sounding voices playing the minor tenor roles and some unpleasant shouting from formerly excellent bass Forbes Robinson, who takes the Sprechstimme approach too far as Justice Swallow. However, these are minor flaws when measured against the totality of the performance, I agree. Highlights for me are the most haunting passages such as the quartet for women's voices "From the gutter", the orchestral interludes and of course Grimes' plaintive monologues, which display the typically frightening intensity with which Vickers depicted Grimes. Odd that, given the supposed conservatism of his tastes and views, yet you may hear in his 1993 interview at the Barbican with Jon Tolansky how completely he identified with Grimes and what he represented about the isolation of the human condition. As a non-fan of Peter Pears, I don't mind that Britten did not like Vickers' representation, so antithetical in every regard to Pears'; I would far sooner hear him deploy that great, husky sound so movingly. I have not heard the late Anthony Rolfe Johnson's Grimes and he is an artist I love; Haitink's cast looks impressive, too, although I wonder if Haitink avoids his besetting default position of understatement; reviews suggest that he does. 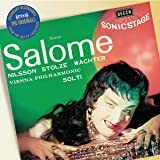 In any case, this recording is now available at super-bargain prices and is widely admired as long as you respond to Vickers' rougher, more elemental portrayal and the individuality of his tenor; I do. The music remains for me patchy, with both bald and spiky spots but also some very beautiful passages and this recording has helped me make progress towards overcoming a lifetime's lack of empathy with Britten's music. This is definitely one of the most exciting versions of the opera around. I say that without having heard e.g. the Hickox version, though, so I cannot, perhaps, say that it is necessarily the best - but it is at least a magnificent account. First of all, it sports a superb cast - Jon Vickers gives a harrowing and vivid characterization of the title role; his Grimes is darkly troubled and full of shadows and repressed violence, yet one cannot but feel a sense of sympathy with the character, at least intermittently. It is a brutish portrayal, but with several dimensions to it with the dreamy, longing side of Grimes being excellently characterized as well. It is, of course, excellently sung, and the occasional strain just adds to the vividness. Listen to ... well, whatever, really, but the pub scene is at least an excellent example where the darkly menacing depths of the character come uncannily to the surface (the only possibly nitpick must be that Vickers sometimes drops certain vocal lines and alters others). Then, of course, there is the excellent Ellen Orford of Heather Harper, superbly sung, fully believable and sympathetically motherly. The smaller roles are excellently taken; Summerly's Balstrode deserves extra praise, and so does John Dobson as the unsympathetic Boles. But most of all, praise should go to Colin Davis, who leads a performance of tense, urgent drama with a true sense of darkening clouds but with the best and most atmospheric Sea Interludes I've heard (and of course, by extension, to the Royal Opera House chorus and orchestra for delivering this masterly performance). The sound quality is detailed and full and atmospheric. An absolutely astounding version of this masterpiece, and urgently recommended.